The best time to visit the Ognissanti church in Florence is on a Monday, Tuesday or Saturday morning. 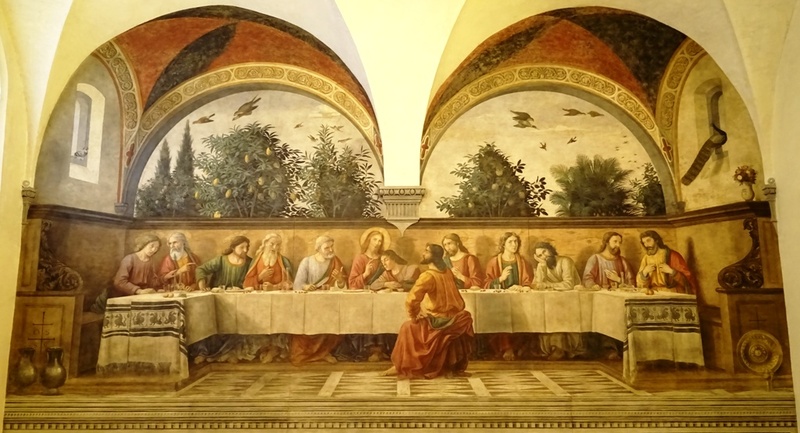 The church is open to the public on other days of the week as well, but only on the days mentioned are visitors allowed to visit the beautiful cloister next door (Chiostro Grande) and the refectory (Cenacolo) with Ghirlandaio’s fresco of The Last Supper. The church itself is worth a visit too. The Ognissanti was given a Baroque makeover in the seventeenth and eighteenth century, but things were not overdone and the interior is relatively sober. 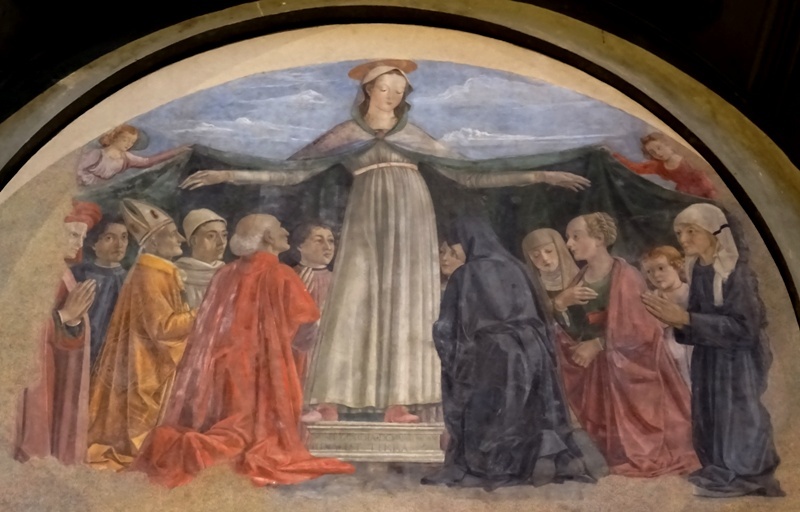 The church has interesting works of art from the fourteenth and fifteenth century by noted artists such as Giotto, Botticelli and Ghirlandaio. 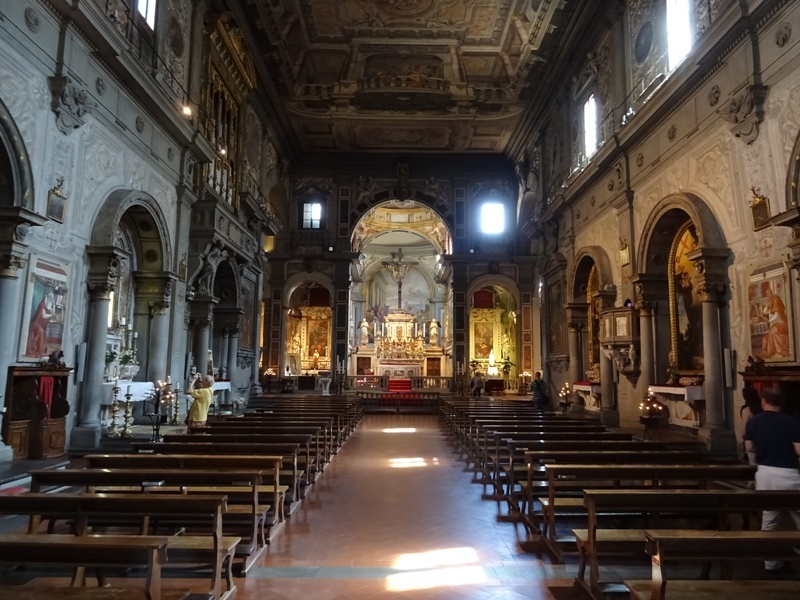 One further note of interest is that the Ognissanti was the parish church of the Vespucci family. A continent – America – was named after the family’s most famous scion, the explorer Amerigo Vespucci (1454-1512). The church was founded by members of the rather obscure order of the Humiliati, the Humble Ones. The origins of this order are not well known, but it seems to have originated in Lombardy. The Humiliati moved from Lombardy to Florence in 1239 and at first settled outside the city. Between 1251 and 1260, they built their church and convent in Florence and dedicated the basilica to all the saints (Ognissanti in Italian). Members of the order were devoted to poverty, humility and hard work, their coat of arms showing the Lamb of God with the slogan “Humilitas vincit omnia”, “humility conquers all”. The order became especially known for its wool-working activities in Florence and the Humiliati were held in high regard. The Humiliati’s power and prestige declined in the sixteenth century. The order was suppressed in 1571 by a Bull issued by Pope Pius V (1566-1572), requested by Grand Duke Cosimo I de’ Medici. The church and convent were given to the Franciscan friars of the San Salvatore al Monte alle Croci on the other side of the river Arno. The Franciscans gave the Ognissanti church its present name, Chiesa di San Salvatore di Ognissanti, with the San Salvatore part being a reference to their other church in Oltrarno. Since the original San Salvatore was in a very bad condition, partly as a result of the Siege of Florence in 1529-1530, the Franciscans began moving valuable items to their new accommodation. Among these items was the most precious relic now held in the Ognissanti, the habit worn by Saint Franciscus when he received his stigmata in 1224. The Franciscans immediately set about altering the whole Ognissanti complex, adding two more cloisters and re-consecrating the church in 1582 (they would leave their old church and convent in the hills for good in 1665). New altars, paintings and sculptures were made in the seventeenth and eighteenth century and the Ognissanti became a sober Baroque church. Artists employed by the Franciscans include the painters Jacopo Ligozzi (1547-1627) and Giuseppe Romei (1714-1785) and the architects Sebastiano Pettirossi and Matteo Nigetti (died 1648). Pettirossi was in charge of the internal renovations, while Nigetti was responsible for the new facade of the church, which was completed in 1637 and restored in 1872. 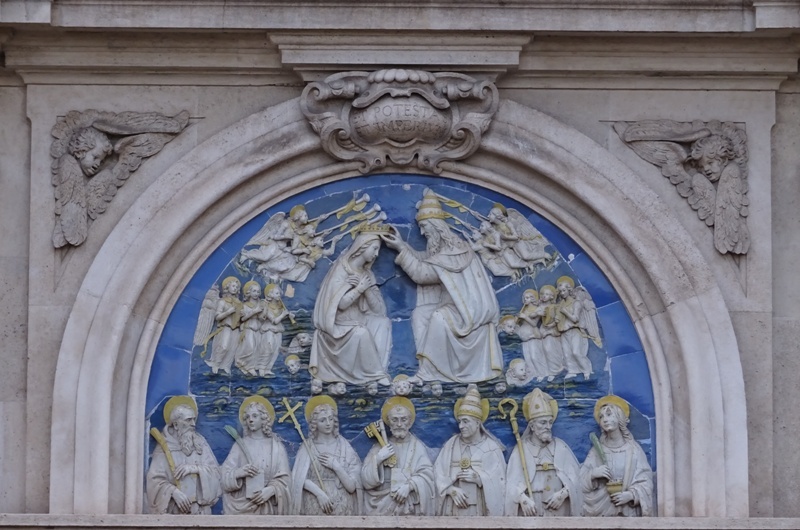 Above the doorway is a beautiful glazed terracotta lunette with The Coronation of the Virgin by Benedetto Buglioni (ca. 1460-1521). The slender campanile dates to the fourteenth century. The Unification of Italy led to a suppression of the religious orders in 1866, and the Franciscans of Ognissanti were not spared. The complex was confiscated and only a tiny portion was returned in 1885. But the friars have stood firm, and there is still a Franciscan presence here. Although they were devoted to poverty, the Humiliati seem to have had plenty of money to spend on decorations for their church. The famous artist Giotto di Bondone (ca. 1266-1337) was commissioned to paint a panel that was intended for the church’s high altar. This so-called Ognissanti Madonna, which measures 325 by 204 centimetres, can now be found in the Uffizi Gallery. The church also possesses a crucifix (ca. 1310-1315) which was long held to be the work of a follower of Giotto. The crucifix had become blackened by candle smoke and other dirt, and previous attempts at maintenance had been poorly executed. The process to clean the crucifix took several years. When the original bright colours reappeared, the researchers were confident that this was a work by the master himself. 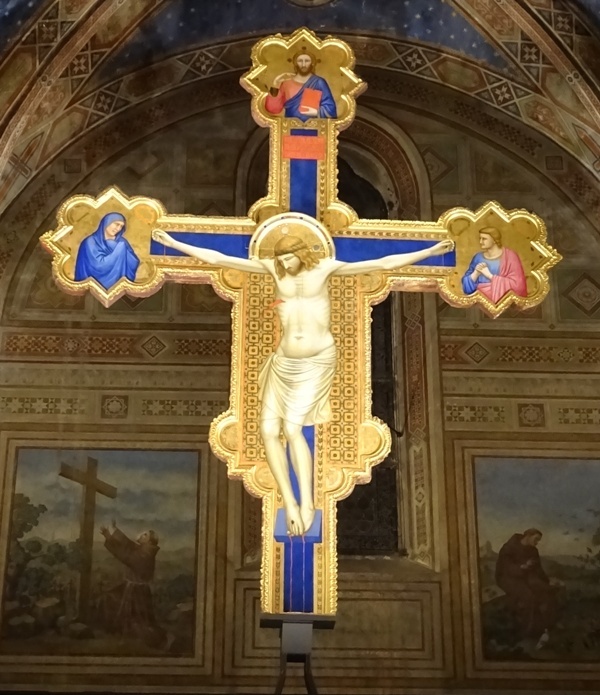 The restored crucifix was moved to the left transept of the church, where it can be admired once again. Since the lighting in this part of the church is very good, it is possible to see Giotto’s wonderful use of colour. Christ is flanked by the grieving Virgin Mary and Saint John the Evangelist. Unfortunately, the information panel in the Ognissanti has not yet been updated. Even though Giotto’s authorship was established way back in 2010, the panel still asserts that the crucifix was painted by a follower (I visited the church in June 2016). Sandro Botticelli (ca. 1445-1510) is one of Florence’s best known Renaissance painters. His Primavera and The Birth of Venus, both in the Uffizi, are world-famous. Botticelli was buried in the Ognissanti church. His simple tombstone can be found in the right transept. This part of the church was undergoing restorations when I visited the Ognissanti in June 2016, but the Franciscans where kind enough to leave a note in biro on one of the scaffolds, indicating where the tomb could be found. You might still miss it if you do not know that Botticelli’s real name is Alessandro di Mariano di Vanni Filipepi. 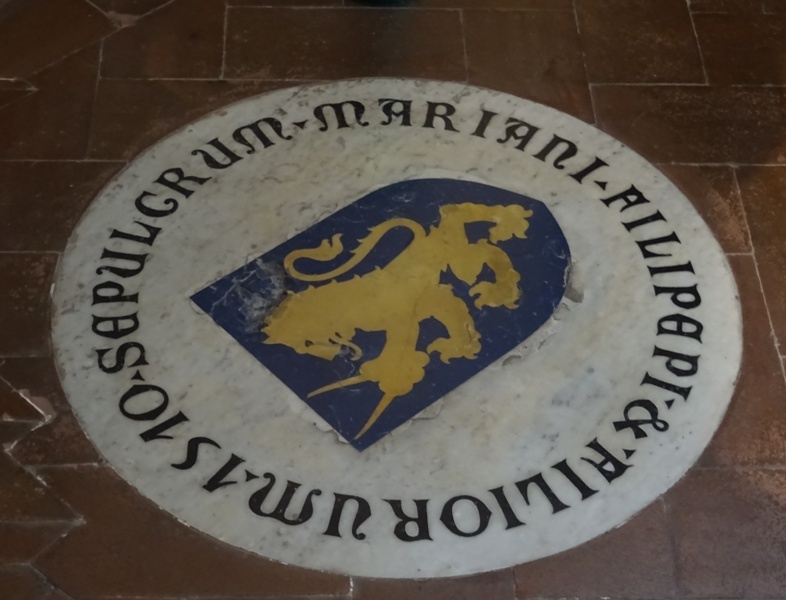 It is the name Filipepi which appears on the tombstone, together with the year of death 1510. Botticelli reportedly wanted to be buried in the Ognissanti because his beloved Simonetta Vespucci was also laid to rest here. Simonetta was a noblewoman from Genoa who had married into the Florentine Vespucci family. She was known for her great beauty and died in 1476 at the tender age of 22 (other sources assert that she was only 18 years old). The precise relationship between Botticelli and Simonetta will probably never become clear, and whether he used her as a model for his paintings (even after she died) is very much up for debate. However, she must certainly have been dear to him, as he requested to be buried at her feet. 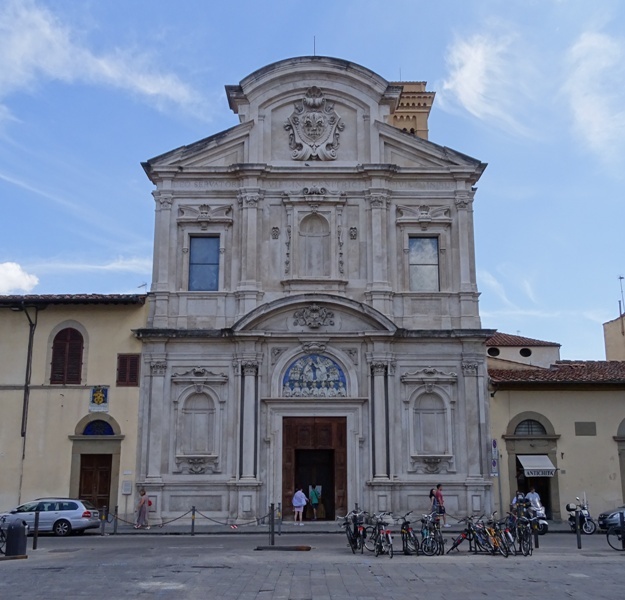 Since the Ognissanti was the parish church of the Vespuccis, this is where Simonetta was interred in 1476 and Botticelli himself 34 years later. 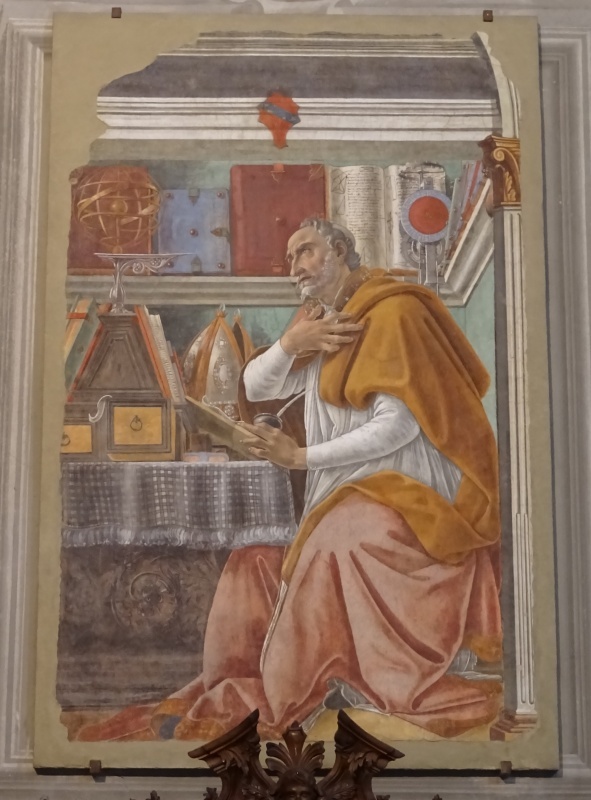 By contrast, Botticelli’s Saint Augustine (354-430) appears to be excited, even emotional. Augustine was a bishop of Hippo Regius in Northern Africa, and his bishop’s mitre can be seen on the table (also an anachronism). 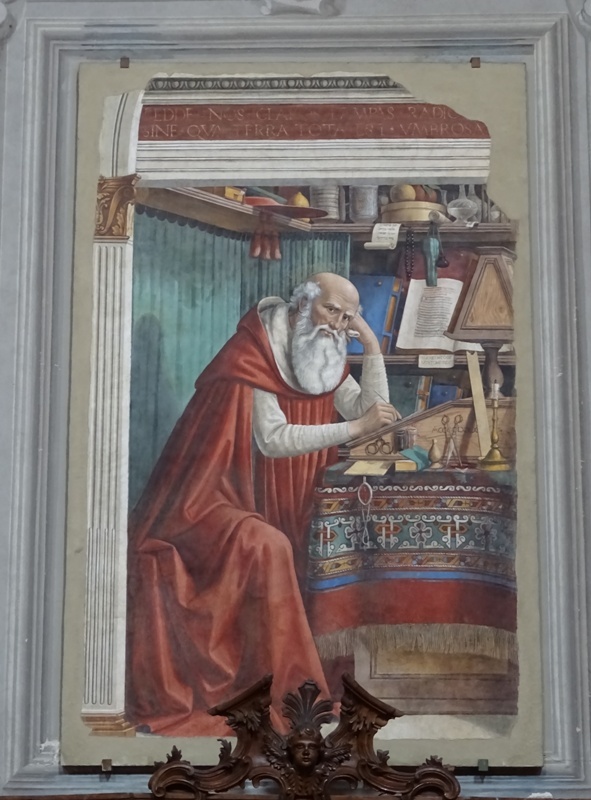 On the shelf above the saint we see an armillary sphere and a book about geometry, representing Augustine’s interest in science. The coat of arms in the fresco is that of the Vespucci family (red and blue with wasps; the Italian word “vespa” means wasp). The geometry book contains a little joke. In the (fake) text are a few lines in Italian about one Brother Mariano, who has gone missing. On a more serious note, the clock on the shelf has the hand between the numbers XXIV and I, indicating that it is just before sunset. This was the hour of Jerome’s death, and according to a letter attributed to Augustine, Jerome appeared to him in a vision at exactly that moment. It is the vision that causes Augustine’s excitement. The clock is the element that links the two frescoes, which are truly inseparable. Ghirlandaio was quite active at the Ognissanti complex. He also painted a Pietà and a Madonna of Mercy (Madonna della Misericordia) in the second chapel on the right. These works were executed in 1472. The Madonna is the most interesting of the two works. She has several people under her protective cloak, and the boy between the Madonna and the man in red is often claimed to be the young Amerigo Vespucci. If you look down at the floor, you will notice a tombstone with the name AMERIGO VESPVCIO. You might be tempted to assume that this is Amerigo’s Vespucci’s tomb, but this is not the case. The explorer Amerigo Vespucci died in Seville in 1512 in Spain was presumably buried there. This is the tomb of a relative who – according to the tombstone – died in 1471. The man was named Amerigo too, so perhaps he was the explorer’s grandfather. Ghirlandaio was also responsible for a large fresco of The Last Supper in the refectory of the convent. It can be dated to 1480, so it was probably executed as part of the same project that produced the fresco of Saint Jerome in his study. The fresco can be visited free of charge, but as stated above: only on Mondays, Tuesdays and Saturdays (between 9:00 and 12:00 if I recall correctly). To get to the refectory, exit the church, turn right and then right again. This takes you to the cloister, the Chiostro Grande. The entrance to the refectory is in the cloister. The Last Supper by Ghirlandaio. Ghirlandaio’s fresco is huge. It measures 810 by 400 centimetres and covers the entire back wall. The fresco has quite a few interesting details. Note for instance the decorations on the tablecloth. Judas sits apart on the other side of the table, while John has fallen asleep and Peter seems to be holding a knife. Christ is the only one with a clear halo. The background of trees and birds is quite impressive. A dove sits on the windowsill on the left. A peacock with a huge tail can be seen on the right. My interpretation: the Holy Spirit and the Christian religion have just arrived while the pagan religion – the peacock is the symbol of the Greek goddess Hera – is about to leave. See Rignano sull’Arno: Pieve di San Leolino for another example of Buglioni’s work. Text and translation taken from Lisa Jardine’s Erasmus, Man of Letters: The Construction of Charisma in Print, p. 81.